Strange and terrible things blossom deep within the Fangwood, twisting plant life and the fey residents into blighted monsters. Many have braved the forest, but Princess Arlantia - the cruel dryad who rules the foresaken woods - allows no trespasser to leave her realm. Yet somewhere within these cursed depths lies the key to the Ironfang Legion's hidden stronghold. Can the PCs survive wicked fey, a festering dragon, and nightmarish beasts? Or will they become prisoners of the blight? 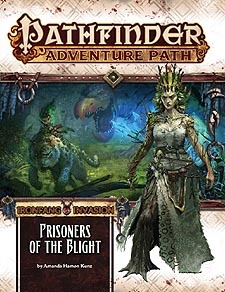 "Prisoners of the Blight," a Pathfinder adventure for 14th-level characters, by Amanda Hamon Kunz. Details on running campaigns in other famous blighted lands of the Inner Sea, by Larry Wilhelm. An exploration of the cult and faith of Cyth-V'sug, demon lord of disease, fungus, and parasites, by Jason Keeley. New fey boons and banes to spice up any campaign that involves the capricious denizens of the First World, by Isabelle Lee. A bestiary packed with festering, fairy-tale beasts, by Paris Crensha, Crystal Frasier, and Amanda Hamon Kunz.